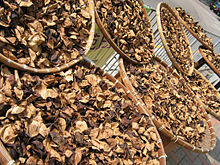 Chenpi or, also called chen pi, is sun-dried tangerine peel used as a traditional seasoning in Chinese cooking and traditional medicine. They have a bitter taste. This page was last changed on 12 March 2013, at 14:10.